After months of intense speculation, Beto O'Rourke is entering the presidential race Thursday, marking an extraordinary rise from little-known El Paso congressman a few years ago to potentially formidable White House contender. "Amy and I are happy to share with you that I'm running to serve you as the next president of the United States of America," O'Rourke says in a video with his wife released Thursday morning. "This is a defining moment of truth for this country and for every single one of us." O'Rourke is making the announcement ahead of a three-day trip to Iowa that begins Thursday afternoon. In the video, O'Rourke says he will travel the country before returning to El Paso on March 30 for a kickoff rally. "This is going to be a positive campaign that seeks to bring out the very best from every single one of us, that seeks to unite a very divided country," O'Rourke says in the announcement. "We saw the power of this in Texas." O'Rourke became a national star last year as he challenged U.S. Sen. Ted Cruz, R-Texas, ultimately losing by a closer-than-expected margin. He campaigned relentlessly, visiting all of the state's 254 counties, and shattered Senate campaign fundraising records while building an army of small-dollar donors and eschewing money from political action committees. In recent weeks, it looked more and more clear that O'Rourke would ride the momentum from his blockbuster Senate run into his party's crowded primary to take on President Donald Trump. It is a primary that already includes another Texan, Julián Castro. Castro had his own announcement shortly after O’Rourke’s on Thursday morning, unveiling endorsements from 30 Texas Democrats. The list included two state senators and 17 state representatives. O'Rourke finally confirmed his intentions Wednesday evening, telling the El Paso TV station KTSM in a text that he had decided to make a White House bid and would announce it Thursday morning. O’Rourke is among the last high-profile Democrats to reveal their 2020 intentions. With his announcement, the spotlight intensifies on former Vice President Joe Biden, who has yet to say whether he is running. O’Rourke begins his White House bid with a number of open questions looming over him. Among them: Can he scale up the do-it-yourself style of his Senate campaign, in which he swore off pollsters and political consultants? And how will his record hold up in a massive Democratic primary versus a statewide general election against someone like Cruz? In November, O'Rourke did not beat Cruz but beat expectations, losing by less than 3 percentage points. And with O'Rourke at the top of the ticket in Texas, Democrats made significant gains down ballot in 2018, picking up two seats in Congress, two in the state Senate and a dozen in the Texas House. Even before the Senate election, O'Rourke was discussed as a potential presidential candidate. During the race, he had promised not to run in 2020 but reversed himself shortly after the election, touching off months of fervent speculation about his plans. As he mulled a White House bid, two "Draft Beto" groups popped up and got to work laying a foundation for him in the early voting states. Looking to shake a post-election funk, O'Rourke took a solo road trip outside Texas, stopping in small towns across the Southwest and blogging at length about his experiences. He re-emerged in early February, when he went to New York City for an interview with media mogul Oprah Winfrey — and revealed that he expected to decide on his plans for 2020 by the end of the month. 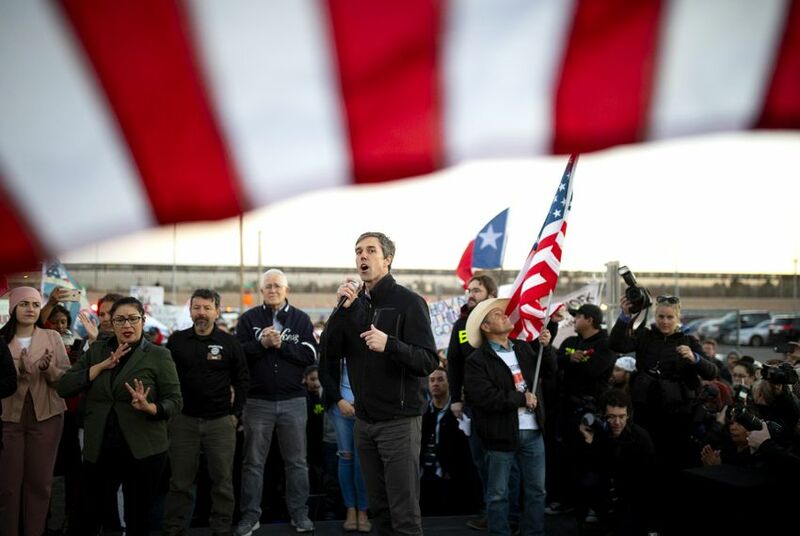 After the Oprah interview, O'Rourke continued to stoke 2020 speculation, leading a counter-rally when President Donald Trump visited El Paso in early February to make the case for his long-sought border wall. Speaking to a cheering crowd of thousands, O'Rourke argued that barriers force immigrants to cross into the U.S. in more remote, dangerous stretches of the border. Around the same time, O'Rourke made another trip outside Texas, visiting Wisconsin and Illinois. “I came here with not much of an agenda other than to listen to you,” O'Rourke told college students in Madison, according to media reports. With his end-of-month deadline looming, O'Rourke continued to keep his options open. At an event in mid-February where he was named El Pasoan of the Year, he did not rule out taking a different path in 2020, such as running against U.S. Sen. John Cornyn, R-Texas. But then on Feb. 27, word got out that he was passing on another run for U.S. Senate, and he teased that more news was forthcoming. "I'm not going to give a date certain but hope to be able to say something pretty soon," he told The Texas Tribune. "I want to announce to everyone at the same time." It has been a remarkable rise for O'Rourke, who was little-known statewide — let alone nationally — prior to his Senate run. Even his 2018 campaign largely flew under the radar for over a year until late summer 2018, when a video went viral of him defending NFL players who kneel during the national anthem. O'Rourke first won election to Congress in 2012, when he unseated U.S. Rep. Silvestre Reyes, D-El Paso, in a primary upset. Before that, O'Rourke served for six years on the El Paso City Council. O'Rourke has come to overshadow other Texas Democrats long regarded as rising stars — including Castro. The former U.S. housing secretary and San Antonio mayor launched his campaign in mid-January and has since been making trips to the early voting states as well as those deeper into the nominating calendar. O'Rourke's Iowa trip — his first since he emerged as a potential candidate — will take him to over a dozen counties across the state, according to his campaign. He is so far scheduled to make stops Thursday in Burlington and Muscatine; Friday in Mount Pleasant and Cedar Rapids; and Saturday in North Liberty, Waterloo and Dubuque. Among the more notable events are a 5K run in North Liberty — reminiscent of the jogging he did with supporters in the Senate race — and a previously announced canvass kickoff in Waterloo for Eric Giddens, the Democratic candidate in a special election Tuesday for Iowa Senate. O'Rourke's campaign noted that of the counties he is visiting, eight voted for President Barack Obama in 2012 before flipping to Trump in 2016. While O'Rourke is among the last prominent Democrats to announce their 2020 plans, he has not lost out on top talent in the Hawkeye State. Iowa Democrats say O'Rourke is working with a veteran operative named Norm Sterzenbach, a former executive director of the state party. The Republican National Committee released a statement Thursday morning criticizing O'Rourke. O'Rourke may not have been reaching out to early voting states until recently, but the draft groups have been building a foundation for him over the past few months throughout the country. One of them, Draft Beto, said it had built a volunteer staff of 24 people, put on 30 house parties in nine states, raised $40,000 and recruited students to lead chapters at over 100 colleges. "This is the moment that thousands of volunteers across the country have been waiting for," said Will Herberich, co-chair of the other group, Draft Beto 2020. "We’re ready to get to work."